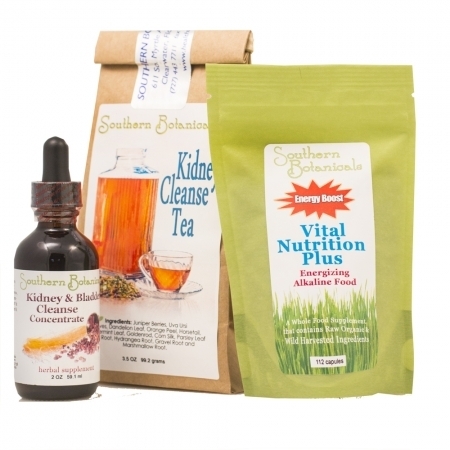 Support & Cleanse Your Kidneys, Bladder & Urinary Tract! The Kidney & Urinary Tract Cleanse Trio offers an effective way to detox and flush irritants, wastes and excess liquid from your kidneys as well as your bladder and urinary tract. The blend of herbal and nutritional ingredients in the Kidney & Bladder Cleanse Trio offers you a deeper cleanse as compared to taking each item on its own. Kidney & Bladder Cleanse Concentrate is a liquid herbal extract with potent diuretic herbs that support urinary system function and strongly flush it. Kidney Cleanse Tea provides the benefit of loose leaf whole herb parts like Juniper berry and Peppermint leaf so you can enjoy the gentle and effective properties steeped in a delicious tasting tea. Vital Nutrition Plus provides a boost of energy and floods your body with natural vitamins, minerals and nutrients. Our bodies work better with adequate amounts of high quality nutrients. You will find Vital Nutrition Plus is an essential addition to any Cleanse program or diet change as it helps to keep your energy high enough to enable you to complete your programs successfully. Some of the benefits of the Kidney & Urinary Tract Cleanse Trio are: flushes the urinary tract, soothes irritated tissues in the kidneys, bladder and urinary tract, tones the urinary tract for better bladder control, increased energy and supports kidney function and a healthy prostate. A full set of instructions is included with your package as well as phone and email support to ensure your success. Ingredients (*Organic, +Wildcrafted): Juniper Berries*, Uva Ursi Leaf*, Dandelion Leaf+, Orange Peel*, Horsetail Herb*, Peppermint Leaf*, Goldenrod Flower*, Corn Silk*, Parsley Leaf & Root*, Hydrangea Root+, Chanca Piedra Leaf+ and Marshmallow Root*. Ingredients (*Organic, +Wildcrafted): Chlorella Algae*, Spirulina Blue-Green Algae*, Orange Peel*, Barley Grass*, Wheat Grass*, Spinach Leaf*, Lemon Peel*, Alfalfa Grass*, Beet Root*, Rose Hips+, Dulse Seaweed* in a base of Nutritional Yeast. Drink 1 - 2 cups of Kidney Cleanse Tea with 1 - 2 droppersful of Kidney & Bladder Cleanse Concentrate 3 times a day for a mild to moderate cleanse. Take eight capsules of Vital Nutrition Plus twice a day. The ingredients of the tea are not powdered, but are dried herbs, seeds, roots, bark and berries. It is recommended to soak the ingredients in pure or distilled water overnight before simmering in the morning to get all the properties and benefits. Consult a health professional before using the products in this package if you are taking medications or have a medical condition.